The Crossed Palms is on the line in this deadly issue of Goldie Vance! 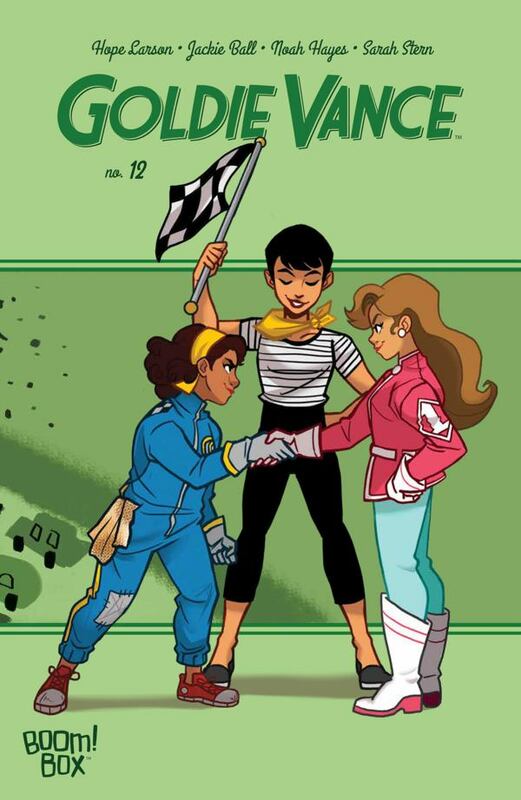 Sugar Maples blazes through the racetrack, ready to prove herself as this devastating case for Detective Goldie Vance concludes! Larson and Bell have done an overall spectacular job on this arc in the comic, and I find their conclusion to the case to be a solid and satisfying ending. I love the evolution of Goldie and Sugar’s relationship throughout the case as well as the character development that Sugar goes through. The ice queen melts into a sympathetic figure, one with tumultuous family ties and a nonexistent home life. The arc makes her likeable, a frenemy to Goldie, and I appreciate the depth that has been given to Sugar’s character. While I do miss the art that Brittney Williams once brought to the pages of Goldie Vance, I do find Hayes’ work in this recently finished arc to be refreshing. His work pairs well with Larson and Bell’s writing and compliments the style of story portrayed in the series. It’s just different enough from Williams’ work to not feel jarring while still keeping the spirit of how she drew the characters, which I think made for a smooth transition. Stern, as always, provides the popping bright hues needed for this retro-50s Nancy Drew-esque comic. The carnival of colors she paints throughout the panels creates a sense of liveliness without being too vivid or obnoxiously bright. I find her best work is shown through a particularly dramatic scene where a car crashes. Her shading for when Goldie rushes over to the car on fire would not be as dramatic without Stern’s work. Jim Campbell, ever the great letterer, adds subtly to the comic with dashes of in your face SFX and well-placed coloring in certain dialogue boxes. The distinction between characters through colors is always a nice touch and I do appreciate the work he does there. What can I say? I’m a sucker for a good detective story, especially when it has a wide variety of interesting characters and a plucky main. I really love Goldie Vance, and I definitely recommend reading all of the series, if you have the time. The cases get kookier and more fun each arc and I can’t wait for the next issue to come out. Go check it out!